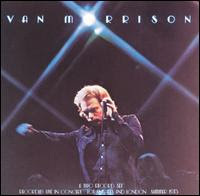 This week's offering from Issa's Sunday Service comes from the album I would take to a desert island if only one is allowed: Van Morrison's It's Too Late To Stop Now. Ok, it's 2 discs, but you'll let me slide, right? Tomorrow is Mr. Morrison's birthday and, as a present, he becomes the first artist to appear on this weekly feature twice (and this will be, by no means, his last appearance). Not much of present, you ask? He has everything else. As with so many of the performances on It's Too Late To Stop Now, this rendition of Wild Children is far superior to the studio original. The song itself sums up a generation, for better and worse, and, if I can mix my clichés, this would be the song I buried in a time capsule on that desert island for some far future alien culture to discover when they go on vacation. Here's a poem from issue #25, September 1991, by Michael Estabrook. It was on my short list to read this past weekend at the Six Gallery Press reading. Try reading this one aloud, softening the repeated words (and parts of words) as an echo would. There were a number of transcription errors, along with a factual one, in the original version of Wednesday's post reviewing Ronald Baatz's Bird Effort, which have been corrected. If you enjoyed the work you read there, you may want to revisit it as the poetry is now presented as it was intended. Thanks very much to Ronald Baatz for pointing this out and for his sympathetic understanding. My apology has been most graciously accepted. 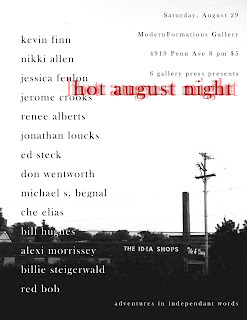 For those of you who'll be in town and not watching the Steelers pre-season game (both of you), a reminder, along with an updated lineup and new poster, for tomorrow's Hot August Night reading at the Modern Formations Gallery. 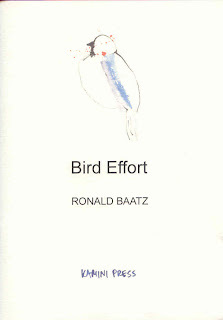 Bird Effort by Ronald Baatz & a "Hot August Night"
There are so many wonderful small presses out there, doing all manner of work, in all manner of styles. One of the finest operations around is Kamini Press out of Sweden. The quality and care put into their books is obvious even before you hold one of their books in your hands: they are, as the cliché goes, a sight to behold. Once in hand, first impressions are confirmed: the cover, the art, the paper, and the overall production is outstanding. Their statement of intent from their website says it all. Respect the poetry with the highest quality production possible, the rest will follow. It makes those of us on the lower end of things hang our heads in shame. All this before even arriving at the first words. The poetry itself. This is the small press at its finest, the quality of work matched by the quality of the production, a beautiful reflection of life, work, dedication, and truth. This Saturday night, there will be a reading sponsored by Six Gallery Press at Modern Formations Art Gallery here in the Burg. 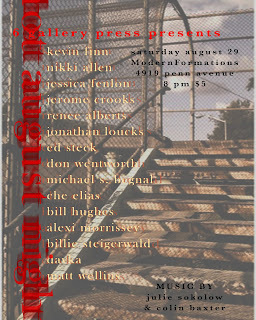 There are some mighty fine people reading that evening and so, if you are in the area, stop by. 14 writers for $5, it doesn't get much better than that. It will be my first public reading in over 20 years and will be a mixture of Lilliput work, in celebration of the 20th anniversary, and my own poems. A number of folks, including Kris Collins, Che Elias, René Alberts, Jerome Crooks, and John Grochalski have managed to drag me out of hiding after all these years and I have to thank them all for helping re-energize an old fart. Fortunately for me (and everyone else), there are so many folks reading that our time will be necessarily brief. 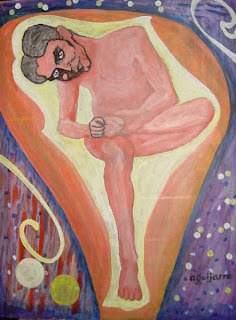 This week's featured issue of Lilliput Review ,#165 from November 2008, is so new it's still not in the archive. Enjoy. He was a Japanese tourist. NB There were a number of transcription errors, along with one factual, in the original version of this post, which have been corrected. Thanks very much to Ronald Baatz for pointing this out and for his sympathetic understanding. My apology has been most graciously accepted. 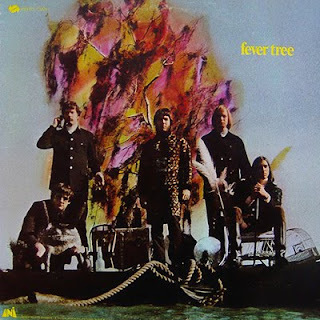 Here's a tip of the hat to the end of summer by way of one heck of an obscure psych band from the 60's, Fever Tree. The literary reference is even more obscure; not many folks break out the Thomas Hardy referenced rock songs, then, now, or ever. It's one of those tunes you listen to 3 or 4 times though and you just can't stop. I've been listening to it for over 35 years. Here's a pair of poems from issue #23, back in 1991, that complement each other well. Enjoy. Longhouse Publishers & Booksellers has been putting out some of the finest publications of poetry, particularly in the short form, for many years. Their little accordion booklet series (4¼ x 11, folded 3 times) has always been a source of wonder and great delight for me. 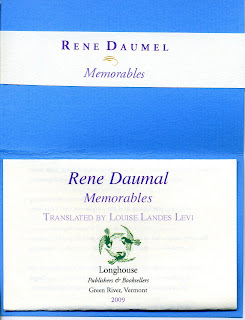 One of their latest publications is a new translation by Louise Landes Levi of René Daumal's 1939 work Memorables. At first, it can almost seem as though the speaker is gently reminding her/himself to remember certain incidents, certain pivotal moments. As the poem builds, however, it feels to me that the speaker is using direct address and that the tone is not so gentle. Of course, perhaps, it is both simultaneously. Sometimes the instances remembered seem literal, at others metaphoric to the point of being surreal. In any case, each seems to a be a piece of a larger whole, resulting in a fragmented yet lyrical of the collective unconscious. indiscrete odor of which crawls in your memory. how to open the other. Ultimately the poem is the mystery of existence; the details are real, with the aforementioned cumulative effect just beyond understanding, no matter how focused one's awareness. It is a beautiful, at times frightening piece, finely translated and beautifully produced. I suspect each reader will be moved by different particular verses. These two touch something deep within, a remembrance of a shared dream, true for all, just as ephemeral, yet as real as the setting sun, as the rising moon. Three color foldout booklet of one long poem Memorables translated by Louise Landes Levi tucked into sky blue papers with signed and unsigned wrap around band. Unsigned $8.95 / signed $12.95. The signature, of course, is that of the translator as Daumal died back in 1944. Why buy the booklet when you can read it in its entirety at the website? Why, indeed. Well, it seems to me the Arnolds know the answer to that question and the answer is the reason they published it electronically. Holding it now in my hands, I know the answer. Hold it in your own and you will, too. For those who might be interested, I recently posted "Why Anne Sexton Matters" over at the Eleventh Stack blog. I've spent the better part of this summer rereading the complete poems of Anne Sexton for the first time in 20 years and am even more moved, amazed, and saddened than I was first time round. Finally, here's a selection from an issue so recent it hasn't made it into the Back Issue Archive. Issue #167 was published in March 2009. Enjoy. --nonetheless draw you down into their water. Well, after lots of wonderful summer weather here in Western Pennsylvania, the heat's finally settled in. Big-time. So it only seems appropriate to blow things out here at Issa's Sunday Service with a ranting screed just this side of hellfire. 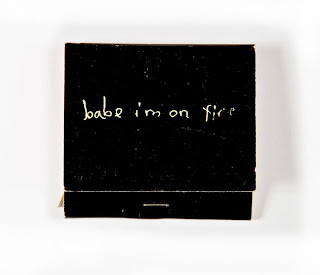 Here's a little 14 plus minute litrock number by Nick Cave and the Bad Seeds entitled Babe, I'm on Fire. There is so much that is so good about this song, I don't know where to start, so I barely will. I just have to say that when someone rhymes "Picasso's Guernica" with "my wife with her furniture" and means it in a most resonant way, I'm backing up and checking out the exits. On the other hand, it's rather sweet that Garcia Lorca (making his 2nd appearance in 2 weeks) and Whitman are reunited here, however briefly. Since very recently the regular weekly countdown of issues passed the count up of issues on the Sunday postings, here's a little something from issue #20 that wasn't in the post that featured that issue. To see and link to and or all 16 songs featured on these Sunday postings, see the Litrock website. Chiron Review is to the small independent press what The American Poetry Review is to university and corporate presses. Founded in 1982, CR has consistently represented the best of small press poets publishing over the last three decades. It is one of my favorite small presses and mostly certainly my favorite that does not focus predominately on the short poem. Edited by Michael Hathaway, CR contains poetry of most shapes and sizes, fiction, interviews, essays, reviews, and general lit mag news. There is an interview each issue with the featured poet; in the issue I have at hand (#86, spring 2009), the poet is S. A. Griffin. There is fine work here also by Antler, David Chorlton, and Richard Kostelanetz, as well as two autobiographical essays by Lyn Lifshin and an interesting piece by the always perceptive Michael Kriesel about a "new" sub-genre he defines as the "Wisconsin Justified Poem": you'll have to read this one yourself and be the judge. CR costs $7 per issue, a year/4 issues for $17. It's one of a handful of magazines I read cover to cover and thoroughly enjoy. Don't get me wrong, though; I don't like everything here. I just appreciate the exposure to the variety and quality of work that is consistently featured in Chiron Review. I recommend it highly. If you miss Chiron Review, you will be missing one of the genuine small press magazines that carries on a long standing tradition of literary excellence only fleetingly encountered in the bigs. I received email this week from Elzy Cogswell of the Austin Poetry Society in which he mentions the possibility of naming a grove of trees across from City Hall in Austin after the poet Albert Huffsticker. I asked and received permission to quote the relevant portion of his email for this post and it follows. of Texas. He never won a Nobel Prize, or even a Pulitzer. I feel closer to the Huffstickler who didn't get rich on poetry. people who are ready to benefit from it. with about eight large oaks, many of them with double-trunks. Street, just north of Ladybird Lake. want to sit down and think. His connection to the facility (i. e. a grove of trees) is the connection between poetry and nature; Huff's work was always grounded in the natural world. The reason for the nomination you already know if you know Huff's work. This all will probably take 10 minutes of your time but if Huff has touched you with his work in anyway, it is a fitting tribute. I've perused the 1st ten issues of Lilliput Review and featured a number of poems from them recently on both the Twitter page and in the Issa's Sunday Service count up. They've given about all they have to give, so I'm going to call this round of featuring poems from back issues of Lillie done. So, I'm not entirely sure what direction I'll be heading in terms of highlighting work from past issues. I can tell you that a great deal of my time over the last few months has been spent in working on two manuscripts, one an anthology of the first 20 years of Lilliput Review and the other a manuscript of my own work. 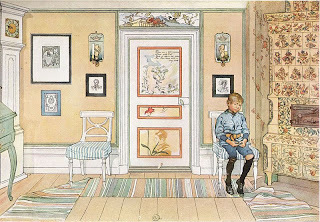 I've been going full bore for quite some time now, on these projects, this blog, Lilliput, the Twitter poem-a-day , and Facebook and need to think through how to proceed. In the interim, I noticed that I hadn't featured any work from some of the issues published since the archive feature began back in July of 2007 on the old Beneath Cherry Blossoms blog. So here's some highlights from #168, from March 2009. Flash forward 20 years: enjoy. no more to be embraced. What can anyone say about the Pogues or Garcia Lorca, for that matter, that hasn't been said? And the only sound was the women in the chapel praying"
Well, that's not bad for starters. Mr. MacGowan had a way with the words and one can only hope that, in the end, he is remembered for just that and not a way with a pint etc. This ode to the great Spanish poet doesn't shy away from the details while evoking a subdued beauty all it's own. As LitRock songs go, it's aces. And if you are wondering about the Ignacio referred to in the first line of the song, here you go. Here's a poem from Lilliput Review #17, November 1991, with a touch of a horror, and a fleeting (oh, wait, he said fleeing) revelation, all its own. PS Been doing this 15 weeks now - here's the entire list so far. 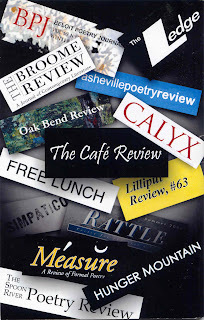 Last year I was asked, along with 13 other small press editors, if I would like to contribute an essay to the 20th anniversary issue of The Café Review, which was scheduled to appear the beginning of 2009. I was honored and, since it was also the 20th anniversary year of Lilliput Review, it seemed a good time to take a look at what I had done, was doing, and hoped to continue to do for some bit longer. The parameters were specific enough to be interesting to the reader and broad enough to give an expansive horizon to the writer. Basically, the question to be addressed was how you, the editor, choose the poetry you select and why. Also, speak to the current state of American poetry, which I felt distinctly unqualified to address, so I chose to speak to the state of poetry itself, perpetually, as I experience it and how that affects my approach to selecting work for Lilliput. Since The Café Review's latest issue is just out, I thought I'd share the essay, which appeared in their Spring 2009 issue. Klimt, processing the images, the intent, and the resonance. that it would be missing that single most important element. answer or this selection of essays would be unnecessary. All great poetry mirrors life, in its entirety or in some aspect. makes a poem worth including in Lilliput Review? body so cold no fire can ever warm me, I know that is poetry. revelation and, frankly, this is no theory. use artwork so that reduces the page number to 13.
per year out of a pot of 3,000.
of detail work worth every single second. So, er, what do you like, Don? go on, but you get the idea. And it resonates like hell. And, oh, did I mention – it’s under 10 lines. This week's selection from the Back Issue Archive arrives at #10, from February 1990. Here's two poems from that issue that still retain their sting. Enjoy. For this week's Issa's Sunday Service, please turn your hymnals up to 11, that's the hard rock setting, and let it rip: it's Willie Dixon's classic You Can't Judge a Book By the Cover, as done by the criminally neglected band, Cactus. Some fine harp, scorching guitar, sweet bass, and a possess'd vocal. Sometimes, a singer/songwriter just won't do. This week's poem from the archive comes from Lilliput Review #26, November 1991. Other poems from #26 were featured in a recent post. This one is a long-time favorite.